That used to be my nick name in high-school. I was a lonely child. JOE BAIRD of Arcadia, Neb., got tired of driving an ordinary Model T Ford, so he got busy and converted it into the “wind wagon” shown above. 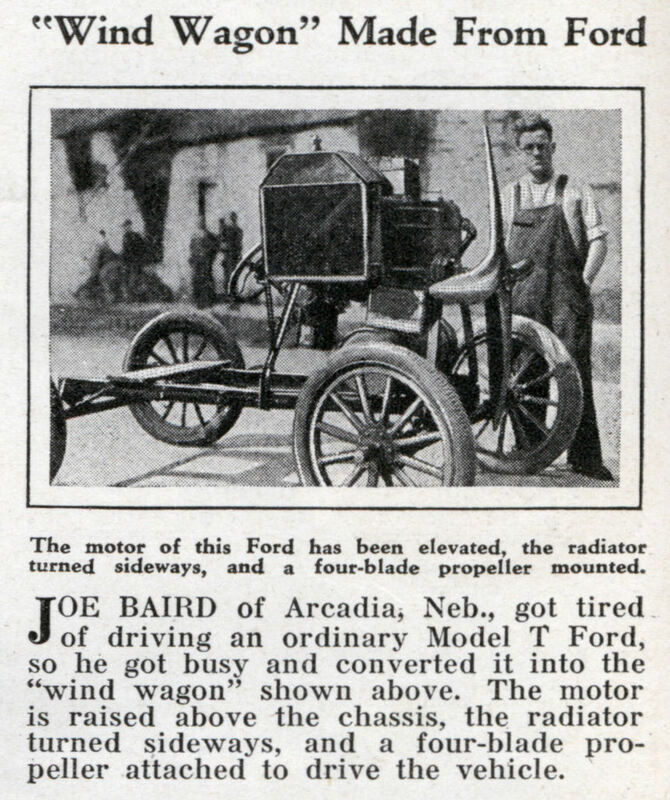 The motor is raised above the chassis, the radiator turned sideways, and a four-blade propeller attached to drive the vehicle. Not only that; no reverse. Looks like something Stan Laurel would invent. And Ollie Hardy would say “and this is another fine mess you’ve gotten me into”. Come to think of it that guy does look a bit like Stan. And well… How can the driver see the road? There’s a lot of these propeller driven cars, boats and sleds from the 20’s & 30’s. About the only group that survived was the propeller driven boats as in air boats.